I actually read the first couple of chapters of the manga for this series. 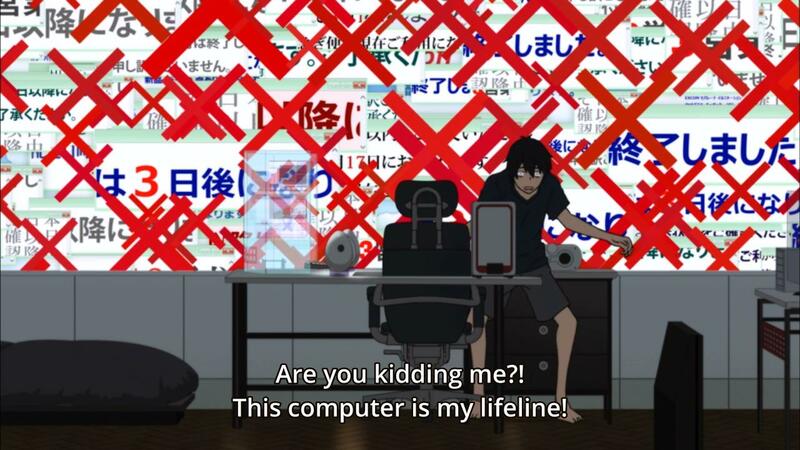 The first episode only shows the focus of the shut-in main character Kisaragi Shintaro as he ventures outside to find a keyboard. I know that the show involves psychic powers to some extent, but that hasn’t been revealed yet in the anime. I’m actually curious whether Shintaro has any special powers of his own or whether his abilities are simply limited to Ene. Speaking of Ene, they adapted her to be just as annoying as I would have expected. The ending song for this episode wasn’t bad. If I remember correctly, this show is originally based off of a set of music videos, though, so I would expect the music to be decent. I’ll probably pick this show up because psychic powers are for all the cool kids. Hopefully it ends up having some interesting direction plotwise and hopefully Ene doesn’t make me kill myself.